Death is inevitable and awesomeness is not. When one is sure about leaving the world, he makes sure that he creates a checklist of things he would want to do before he leaves the earth and starts ticking them off. Lucky are those who know about their departure and start living their life to the fullest, but what about those unlucky people who have no clue about their exit. One may not know about the exact moment, but a tentative articulation helps while helpless are those who are unaware of the moment nearing them with the invisible swiftness. If we are so unsure of when that moment of departure will come, should we always be living the life to the fullest already? Do you believe in the idea of YOLO? Do share your thoughts in the comments below. 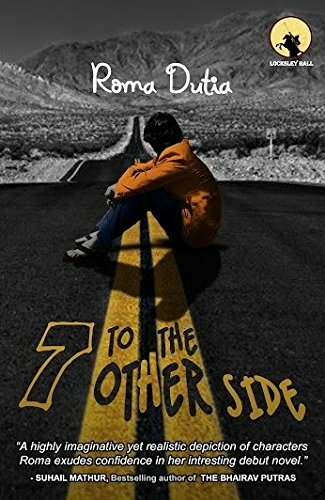 I recently read 7 To The Other Side, a book by debut author Roma Dutia. The book is about the life an individual who departs from the world, one fine day without knowing that his moment of departure was approaching him. It's a story of goodness! The book blurb asks the reader a question, "What if you had 7 minutes to relive your life? What would you like to see? ", which is interesting. I don't know if we get these 7 minutes or not, let us leave that up to science and it's experiments, but it makes an interesting plot for the story and a different way to narrate what the author, Roma Dutia, wants. The story of 7 To The Other Side is about Joshua, a 23 year old guy, who finds himself lying on the hospital bed and not sure of what exactly had happened to him. Then the 7 minutes come into the picture and the story begins right from the childhood to the moment of his death, there is a story beyond his death too, because if people don't talk about you, how would you know their thoughts and your awesomeness. Joshua has a beautiful and a loving family and he loved them back equally, if not more. He comes across as a genuine friend and an obedient child, who knew no limits of caring when it was about his family or friends. He travels to India, Mumbai to be specific, with his group of friends and by chance happens to meet Ayesha who influences, rather encourages him to hone up his skills to be more professional at what he does best and reach for the ambitions but before he departs, does he achieve that? That's for you to read and know. Overall, 7 To The Other Side, is all about the simplicity that an individual can have and display, be loved by everyone that he comes across and is remembered for his deeds. It's a 117 page story with the book cover that goes well with it. Just as the character of Joshua, there is simplicity in the writing and the narration too, and the detailing of the situation just betters it. I would have liked to read more about Joshua in his youth and understand his character more, how he aimed to reach the ambition and how he actually became a person he was. The story revolves more around his childhood and the innocence. Apart from this, it's a quick read and I would recommend this book to anyone who is interested in reading fiction. You can order a copy of the book Amazon. Looks like a short and a very sweet story! I really enjoyed this book. I had no idea what it was about when I began reading it, but it quickly drew me in. This books is so well written that I can see sequence of events happening before me. This book is unique mix of friendship, love and aspirations. The narrative used in this book is simply the best. Dear Venugopal, thank you for your comment. I am sure that the author would be glad to know that you liked the book.